A good Hofmann has to have a surface somewhere between ice cream, chocolate, stucco, and flock wallpaper. Its colors have to reek of Nature – of the worst kind of Woolworth forest-glade-with-waterfall-and-thunderstorm-brewing. Art historian T.J. Clark’s colourful description of Hans Hofmann’s work in his 1999 study Farewell to an Idea: Episodes from a History of Modernism expresses a reaction to the artist’s style associated, in the art world of his day and beyond, with the concept of the decorative. It is not hard to imagine the lush, impasto surfaces and vibrant palettes of Hofmann’s classic slab paintings – Pompeii 1959 (Tate T03256; fig.1) included – being the target of Clark’s acerbic comments. In this essay, I consider Hofmann’s painting practice in relation to the history of the decorative, a long-maligned aesthetic that artists working in abstract idioms have struggled to negotiate in an art world that has historically privileged the intellectual over the sensual. These suspicions of colour and its association with the decorative were inherited in turn by modern artists, who, like Hofmann in his theory of push and pull, did their best to reposition its compositional role as central to the creation of form rather than a subordinate element that poses a threat to order. Although in Hofmann’s philosophy colour is privileged over line, thus overturning the hierarchy that historically suppressed it, colour was nevertheless still discussed as a ‘problem’. Colour, Hofmann insisted, is ‘not a creative means in itself. We must force it to become a creative means’.12 Considered in relation to the history of colour’s inferiority, Hofmann’s push and pull theory, which harnessed colour for constructive purposes, also looks like a disciplinary tool used to tame colour’s excesses. Hofmann’s approach elevates colour’s function, differentiating it from its unbridled use in decoration or design where it cannot play a constitutive role in the determination of form. In both of these profiles, Hofmann’s theory of colour as exemplified in his push and pull method was replaced by a more decorative reading: colour as a ‘simple sensation’, extended and brought to life in space. These reductions and generalisations are unsurprising given the popular audiences these magazines were designed to reach, and they complemented storylines about the couple’s creative approach to interior decoration designed around Hofmann’s paintings. Like Hofmann’s utilisation of coloured rectangles as a design aid, these magazine profiles complicate our understanding of Hofmann’s relationship to the decorative. Although he might have theorised the distinction between art and decoration in his published writing as definitive, in actual practice his position appears much more ambiguous. While this ambiguity might not have served him well in posterity – as evidenced by his unstable place in the abstract expressionist canon or reactions to his work such as those of Clark – it mirrors a post-war context in which the distinction between the art and the decorative was, in fact, open to debate. 1. T.J. Clark, Farewell to an Idea: Episodes from a History of Modernism, New Haven and London 1999, p.397. 3. On this subject see Jacqueline Lichtenstein, The Eloquence of Color: Rhetoric and Painting in the French Classical Age, Berkeley 1993; David Batchelor, Chromophobia, London 2000; and Rosalind Galt, Pretty: Film and the Decorative Image, New York 2011. 4. For a full discussion of Greenberg’s understanding of the decorative, see Elissa Auther, ‘The Decorative, Abstraction, and the Hierarchy of Art and Craft in the Art Criticism of Clement Greenberg’, Oxford Art Journal, vol.27, no.3, 2004, pp.341–64. 5. For an account of the relationship between abstraction and décor at an earlier moment, see Nancy Troy, ‘Domesticity, Decoration and Consumer Culture: Selling Art and Design in Pre-World War I France’, in Christopher Reed (ed. ), Not at Home: The Suppression of Domesticity in Modern Art and Architecture, London and New York 1996. 6. For more on Hofmann’s mural commissions see Emily Warner, ‘Slabs and Walls’, in Emily Warner (ed. ), In Focus: ‘Pompeii’ 1959 by Hans Hofmann, February 2018. 7. Hans Hofmann, ‘Statement’, in Hans Hofmann: Recent Paintings, exhibition catalogue, Kootz Gallery, New York 1952; reprinted in Helmut Friedel and Tina Dickey, Hans Hofmann, New York 1998, p.96. Emphases in the original. 8. Hans Hofmann, ‘The Painter and His Problems: A Manual Dedicated to Painting’, unpublished typescript, 1963; reprinted in Friedel and Dickey 1998, p.99. 9. For a design comparison, see the ‘paste-ups’ of designer Florence Knoll, which visually and materially presented the interior architecture of the Knoll Planning Unit through pasted swatches of colour and textured fabrics. Although the paste-ups were a client presentation tool, as in Hofmann’s mural planning they used abstract areas of colour to suggest three-dimensional spatial relationships. 10. 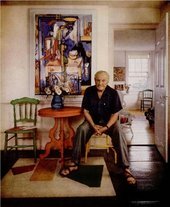 ‘A Master Teacher: Hans Hofmann Influenced Three Decades of U.S. Art’, Life, 8 April 1957, pp.72–6. 11. On this subject see Lichtenstein 1993 and Galt 2011. 12. Hans Hofmann, ‘The Color Problem in Pure Painting – Its Creative Origin’ , reprinted in Karen Wilkin, Hans Hofmann: A Retrospective, exhibition catalogue, Naples Museum of Art, Florida 2003, p.40. 13. 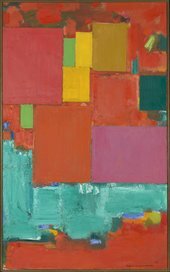 See ‘Living in a Painting: Hans Hofmann Had Made His House a Series of “Still Lifes”’, Look, 28 July 1953, pp.52–5; and ‘A Master Teacher’, 1957. 14. See ‘Living in a Painting’, 1953, p.52. 15. ‘A Master Teacher’, 1957. Elissa Auther, ‘Abstraction and Decoration’, in Emily Warner (ed. ), In Focus: Pompeii 1959 by Hans Hofmann, Tate Research Publication, 2018, https://www.tate.org.uk/research/publications/in-focus/pompeii/abstraction-decoration, accessed 23 April 2019.